We are ending the season of tremendous growth and fresh, healthy fruits and vegetables. Among those fruits are grapes; it is harvest time in the northern hemisphere. It corresponds as well with our two seasons of industry wine shows, where we taste the new vintage wines and new wines that our distributors are bringing into Vermont. At the shop, our portfolio of wines shifts from mostly whites and ross, to about two-thirds reds, the rest whites, ross and sparklings. As we taste new wines, I am reminded of a wine industry factoid, i.e., that 80% of the world s wine is made from just 20 of the more than 1368 different wine grapes. Our customers know that is not the ratio to expect at Windham Wines. We are a small shop only 520 different labels. Wines must compete for shelf space. Our identity has evolved over our twelve years to reflect our customers interests. We have learned that you prefer sustainably produced–ideally organic or biodynamic, wines from family-owned farms that maintain the cultural uniqueness of the place from which they come. …In small geographic pockets, winegrowers have stuck with their native varieties. 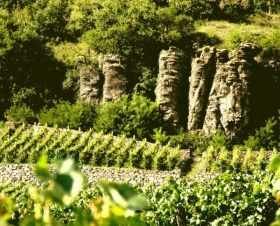 It s probably not a surprise that the kind of winemakers who grow obscure grapes are often the same ones who are committed to organic farming, hand harvesting and natural winemaking techniques. Every new grape you’ve never tasted before offers the chance to experience a new flavor not to mention the environmental benefits of a more diverse and sustainable industry. Below we share some of the many other 20% wines that we carry. It s an interesting, rich, even exciting journey that we have been on with you to explore some of those other 1345+ varieties. Thank you for your curiosity, for sharing your travels with us through requests for wines from areas you have visited and for supporting family farms and healthier ecological systems in the process. We have been talking about creating a century club program at Windham Wines, wherein we give you a passport to be stamped (verified by one of us) as you work your way toward tasting one hundred different varieties of wine grapes. Our wine tastings are opportunities to sample multiple varieties in one session. This season, we expect to add more informal tastings to provide even more opportunities to get your wine passport stamped. Stay tuned as we work out the details; I hope those will be finalized before the next email. In the meantime, our tasting season gets underway with an unusual opener Bosnian wines, with Indira Bayer, who will be joined by two Windham county locals with very personal experiences of Bosnia. From 2007-2012, Patricia Whalen was an International Judge in the War Crimes chamber of Bosnia-Herzegovina. Under the pen name, Robert Madygin, Bob Madrigan wrote a novel entitled The Solace of Trees, that begins in Bosnia during the Muslim genocide following one of its young survivors. As we launch this tasting season, we have completely uncharted wine and grape territory. We look forward to seeing you soon at Windham Wines.